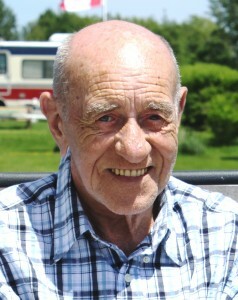 The death of Bernard (“Bernie”) Léonide Cormier, 79, of Moncton, occurred at The Moncton Hospital on Sunday, August 26, 2012, following a long period of failing health and a battle with cancer. Born in Moncton on July 11, 1933, he was the son of the late Émile and Léonie (Cormier) Cormier. He was a previously a longtime resident of Greenhill Drive in the Lewisville area and grew up in Moncton’s East End on Wesley Street. Most recently, he was a resident of Manoir Notre-Dame. He is survived by two sons, Brian Cormier and Roger “T-Boy” Cormier (Sue Langin and her children James Langin and Kristopher Langin) and one daughter, Sherri Cormier, all of Moncton; grandchildren Vanessa Cormier, Miguel Cormier, Ethan Wylie and Ryan Jewkes; brother Camille “Cammy” Cormier (Marguerite) of Moncton; sisters-in-law Maria Cormier (late Gérard “Gerry”) of Ashburnham, Mass., Shirley Cormier (late Normand “Blackie”), Betty Cormier (late Louis), both of Moncton, Bertha Cormier (late Patrice), of Windsor, Ont., brothers-in-law Gérard Julien (late Thérèse, Noëlla), of Dieppe, and Alfred Randall (late Lucille), of Mississauga, Ont., as well as several nieces, nephews and cousins. He is also survived by the mother of his children and former wife Freda (Pineau) Cormier, of Saint-Philippe, and is fondly remembered by Freda’s family: Omer “Joe” Pineau (Claudia) of Hope River, PEI, Enid Watson and Eunice Leger (late Roger) of Dieppe, and Cynthia Mooney (Gerard) of Iona, PEI. Besides his parents, he was predeceased by his brothers Gérard “Gerry” (Maria), Romeo (late Barbara), Normand “Blackie” (Shirley), Louis (Betty), Patrice (Bertha), Camille (in infancy), and his sisters Thérèse (Gérard Julien) and Lucille (Alfred Randall). He retired from The Moncton Hospital’s Materials Management Department in 1999 after 15 years of service. Previous to that, he was an employee of DRG Globe Envelopes and a longtime employee of Marven’s Biscuits from 1949 until its closing in 1978. He enjoyed hunting, fishing, playing cards, watching Hockey Night in Canada (especially Sidney Crosby and the Pittsburgh Penguins), gardening, and was an award-winning pool player. He was a past member of the former Champlain Club in Dieppe. He also enjoyed spending time at Dooly’s on Elmwood Drive, as well as at Sports Rock and Tim Hortons with “the boys” on Paul Street. The family would like to express their deep gratitude to the staff and residents at Manoir Notre-Dame for their kindness, care, concern and friendship toward Bernie during his stay with them from December 2010 until he was hospitalized on June 2. Thanks also to Dr. Scott Cameron, Dr. Peter Forbes, Dr. Dhany Charest, Dr. Kathy Ferguson, Dr. Linda LeBlanc, Dr. Hazem Assi and Dr. Pamela Mansfield, as well as to the wonderful nurses and staff of the 4100 unit, 4600 unit and the palliative care unit (3600) at The Moncton Hospital for their outstanding care. Resting at Frenette’s Funeral Home, 88 Church Street, Moncton, with visitation from 2-4 p.m. and 7-9 p.m. on Wednesday and on Thursday from 8:30 a.m. until departure at 9:20 a.m. Funeral mass will be held at St. Bernard’s Church, 43 Botsford Street, Moncton, at 9:30 a.m. on Thursday with Father Allison Carroll presiding. Reception to follow in the church basement. Interment will take place in Our Lady of Calvary Cemetery, Dieppe. Arrangements are in the care of Frenette’s Funeral Home, 506-858-1900.